This mosaic showcases six pieces of work by artists and artisans evoking a sense of summertime as we wind down the season. 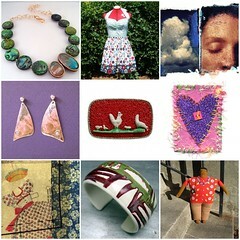 Mosaic compiled by, Mimi K. and includes work by Stonehouse Studio, Elizabeth Brennick Designs, Reclaimed To You, Karalee Designs, Creatively Anew, and Mimi K.
Check out all these Etsy shops using the links in the right-hand column. I'm a winter kind of gal, but these images are so great it makes me almost long for a few more days of summer. Looks fantastic, I can't wait to see it when it is done. I love Anthropologie myself, it just pains me to spend that much money on an item of clothing (especially with three little rugrats! )..